Two nights at the vortex. July 31st, 2006 · Comments Off on Two nights at the vortex. Been to two gigs at The Vortex in the last week – last Monday, I went to see the launch of Ingrid Laubrock and Liam Noble’s album ‘Let’s Call This…’ – I’ve heard Ingrid play before, in a quartet, but wasn’t familiar with Liam’s playing other than through MySpace. The music was exquisite, whether improvising or playing Monk tunes, the interplay between the two was gorgeous, with Ingrid switching between squeally extended range techniques and lovely lush full melodic stuff, with Liam providing entirely unpredictable but completely logic accompaniment – a really really interesting piano player. The album is released – like so many great UK jazz albums – on Oliver Weindling’s Babel Label, home to such artists as Polar Bear, Acoustic Ladyland, Christine Tobin, Huw Warren… definitely worth investigating. Then this saturday, Lianne Carrol was booked to play but fell ill, so the lovely and ever-so-slightly mad Estelle Kokot was booked to fill in, and did a fab job. It was also a rather nice London jazz hang, with JazzShark over from NYC, Orphy Robinson calling in, Huw Warren visiting from north west Wales, Christine Tobin nursing a nasty cut in her leg from a bike accident, and the aforementioned Oliver Weindling from Babel Label. The Vortex is a lovely place to hang out – if you see something on their Programme that you’re going to, drop me a line and I might meet you there if I’m not playing myself. Dalston feels like it’s a bit out of the way, but if you’re driving from north london it’s really easy to get to, and it’s just round the corner from Dalston Kingsland BR station… Go on, go out and support some homegrown jazz instead of wasting your time and money on an overpriced trip to Ronnie Scott’s. as they say in the hood. BJ Cole – genius of the pedal steel, plays on one track on my new album. Cleveland Watkiss – Recycle Collective regular, one of the greatest singers I’ve ever heard, let alone worked with. Calamateur – Scottish singer/songwriter and found-sound experimentalist. Writes really beautiful songs, and we’ve got a duet album coming out some time in the next few months. Theo Travis – Saxophonist… you know who Theo is by now, right? Leo Abrahams – guitarist at the last Recycle Collective gig. Bloomin’ marvellous. Orphy Robinson – vibes/percussion/trumpet/weirdness. An amazing musician and composer. 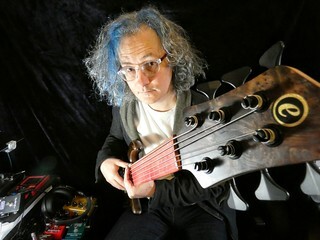 Trip Wamsley – solo bassist, composer, player and writer of gorgeous music. New album coming out soon. 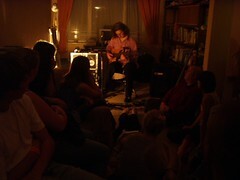 Jeff Taylor – played at the first Recycle Collective gig. Great singer/songwriter. There you go, I’ll add some more soon. Click on those, have a listen, if you’re on myspace already then leave a comment, buy the CDs of the stuff you like, and check out their gig lists! Another fun evening at Darbucka was had! The line-up, as you know, was me and Patrick Wood followed by Orphy Robinson and Roger Goula. The first problem was how to get it all on the stage! There was so much gear it was untrue – Patrick had a keyboard, a Rhodes and a guitar, all running through mixers and pedals and stuff. I had the usual leaning tower of stevie, Orphy had a steel pan, bass marimba box thing, snare drum, trumpet and a huge hold-all full of miscellaneous percussion. So we did the set-up in two halves. First for Patrick and I, then for Orphy and Roger. The set with Patrick went really well (from where I was sat!) – an opening ambient excursion, followed by a more jazzy/dubby piece, into a sort of drum ‘n’ bass/IDM workout over a heavily filtered frantic slap-percussive thing, and finally a version of ‘A Kind Of Prayer’ from The Works album, ‘Beware Of The Dog’. All of which was lots of fun. Because of the stage set-up Patrick was behind me, which was a little disconcerting for him I think – I’m kind of used to looking at buttons and not neccesarily at the person I’m playing with, so it was less problematic for me, but he played beautifully anyway. Patrick’s a really interesting person to play with, as he has myriad ways of shifting harmony against a loop – at some point I need to sit him down and find out what he actually does! The hugeness of some of his synth sounds added a lot of depth to the transitions between sections within particular tunes, and each time I use it, the Looperlative makes more sense, so I felt like I was really on top of the loop side of what I was doing – nothing happened that I didn’t want to make happen! Orphy and Roger’s set started out in a much more ‘out’ free improv direction, with a sparse 9/8 loop off Orphy’s bass marimba thing, and lots of chaotic sounds over the top. Both the main strength and weakness of looping is that it imposes a sense of form onto what’s going on, which is great if you’re doing free stuff as it gives the audience something to latch onto, but it can be a problem if you trap a sound that you don’t want there and aren’t using a looper with an undo function! Orphy uses the Roland RC-20, which just has start stop and layer (oh, and reverse if you bend down and change it by hand, which he did at points). So the constant nature of Orphy’s loops provided both a reference point in the maelstrom of the out sections, and something for him to wrestle with when he may have wanted a more subtle transition. 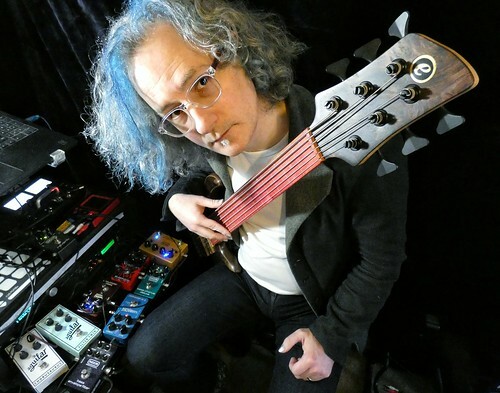 fortunately, Roger was using one of the most sophisticated processing/looping/cleverness music packages in the world – MAX/MSP, a software program running on a Mac, which meant he could do all kinds of crazy stuffs to his loops and his processing. All in, I enjoyed their set – it was a lot more out and free than previous RC stuff, and more out and free than most future RC stuff, but it felt good to stretch things a little and try some things out, and there were some really lovely moments. The quartet piece at the end was kinda fun too, which for some reason sounded to me like a Dave Gruisin soundtrack piece after some seriously heavy narcotics. In a good way. :o) So another enjoyable evening at the collective. March 16th is the next one – not that far away – and it’ll feature me, Thomas Leeb (a brilliant acoustic guitarist from Austria, living in California) and BJ Cole. Put it in your diaries! And then tonight, theo and I are in Cambridge – see you there! Went into town this morning (town=central London), ostensibly to pick up a copy of Sibelius G7 software. It’s a score-writing package, that I need to be able to a) do my column for Bass Guitar Magazine properly and b) get a load of PDF scores of my stuff up on the web-shop ASAP. I get emails every week from people requesting the sheet music or ‘TAB’ for my tunes. Rest assured, there’ll be precious little TAB going on. Reading music isn’t hard, and is a much more useful skill that interpreting numbers of frets on imaginary fingerboards so that you can learn lots of really simple songs badly. And recording that piece has got me all excited about tomorrow night’s Recycle Collective gig – I’m playing in a duo with Patrick Wood – Patrick and I have recorded together lots over the years, lots of lovely improv stuffs, some of which is in the street-team stash (or was – I’ve no idea what’s currently in the stash!). We’ve also played live together at Greenbelt, both in a duo, and he was a part of my Global Footprint huge improv thingie last year. So we’re playing, followed by Orphy Robinson and Roger Goula – both of whom are fabulous players I’ve collaborated with in the past. I really am like a kid in a toy shop with the Recycle Collective – I get to book all my favourite people to come and make lovely noises with me, in a gorgeous venue, to lovely audiences, which you’re more than welcome to come and be a part of. See the RC website for more details. So that’s tomorrow. I’ve been doing LOADS of teaching of late – schedule is filling up, for sure, I’m almost maxxed out on evening teaching (if you’re wanting any lessons, best book a fair way in advance…) but I’m looking forward to my next lot of gigs – book shows in April with Muriel Anderson in the UK, and some solo stuff in April, as well as some clinics/masterclasses around… watch this space!